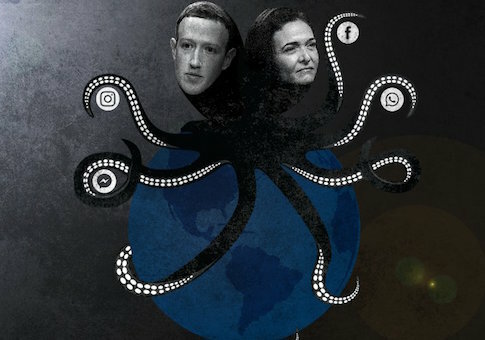 The recently launched Freedom from Facebook coalition, which includes anti-Israel groups such as Jewish Voice for Peace and Linda Sarsour's MPower Change as members, showcased signs portraying two top Jewish Facebook officials as an octopus with its tentacles across a globe, an anti-Semitic trope used by the likes of Nazi Germany to push conspiracies of Jewish control. Freedom from Facebook members showcased the signs showing Mark Zuckerberg and Sheryl Sandberg as an octopus in the opening moments of Facebook executive Monika Bickert's testimony to the Judiciary Committee. The signs could be seen clearly in C-SPAN's broadcast, though the protesters were quickly told to put away the signs and removed from the hearing. A clearer image of the sign was posted shortly after they were displayed at the hearing by Eddie Vale, a communications representative for Freedom from Facebook. 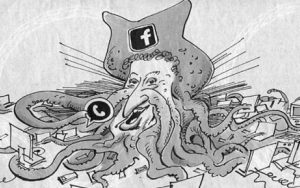 The portrayal of Jews with tentacles over the globe is nothing new and has in fact already been used against Facebook's Zuckerberg by German newspaper Süddeutsche Zeitung, which eventually apologized for publishing it. Vale, who told the Washington Free Beacon he himself designed the signs, said any notion that his cartoon is anti-Semitic is "silly." He said his intention was to play off a cartoon critical of Standard Oil, which also includes an octopus. "We're arguing Facebook is a monopoly, we made a graphic riffing off of the most famous antimonoply cartoon in American history," Vale said. "That's all it was and I am confident in saying that because I know what was in my head through this entire process." The artist responsible for the German cartoon also denied intent to play on Jewish conspiracies, saying he was "shocked" by the interpretation. He apologized and altered the cartoon to remove Zuckerberg's face, which was outfitted with Jewish stereotypes such as a long nose. Rabbi Abraham Cooper of the Simon Wiesenthal Center told the Washington Free Beacon that he is deeply critical of Facebook and thinks it is a worthy target of protest, but said "nobody should be targeted in this way." "The use of the hydra or octopus is classic anti-Semitism, it's used in the Protocols of the Elders of Zion, the old anti-Semitic text from the late 19th century," Rabbi Cooper said. "It went a long way not just to identify Jews as a nefarious enemy, but also as animals. In this case, you have the heads of two prominent people depicted as an inhuman way. It may not be the motive, but the impact is still huge." Rabbi Cooper suggests Freedom from Facebook pull back the image and figure out how to send the same message without the anti-Semitism. "They now have information they didn't have before, sit down and figure out how to get across the same message without using this classic anti-Semitic tactic," he said. "They should make a public statement, pull it back, and come up with something better." 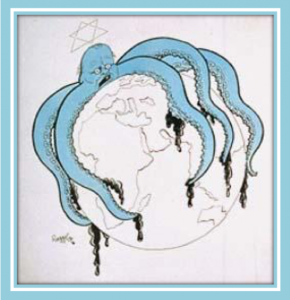 Nazi cartoons, such as one aiming to show Britain's Winston Churchill as an octopus under Jewish control, often pushed the conspiracy that powerful Jews had control of world affairs. When the National Rifle Association portrayed Michael Bloomberg, also Jewish, as an octopus and warned of his "tentacles" across the country, the Associated Press labeled it an anti-Semitic symbol. "The eight-armed sea animal has been used as the Nazi representation of Jewish conspiracy and control, and was referenced by Adolf Hitler in ‘Mein Kampf,'" it wrote. Groups dedicated to confronting anti-Semitism said it was "unforgivable," even if the NRA had no intent to attack Bloomberg's religion. "For them not to know this is really, really stupid," said the American Jewish Congress. "You take a powerful Jewish figure, and show him in a way that provokes traditional anti-Semitism, it's really unforgivable." 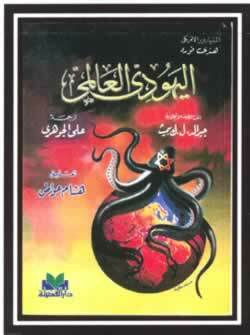 "The International Jew," an anti-Semitic text authored by Henry Ford, featured an octopus with its tentacles around a globe on its cover when it was reprinted in Egypt in 2001. The Washington Free Beacon reported the involvement of anti-Israel groups in the coalition shortly after Freedom from Facebook launched. The odd partnership between liberal economic groups and anti-Israel groups such as Jewish Voice for Peace is rooted in anger over Facebook's decision to censor content aimed at inciting violence against Israel. The Anti-Defamation League labels Jewish Voice for Peace as "a radical anti-Israel activist group that advocates for a complete economic, cultural and academic boycott of the state of Israel." Josh Block, president of The Israel Project, was critical of the Freedom from Facebook coalition's decision to align itself with Jewish Voice for Peace. "Groups that allow JVP into their coalition are aligning themselves with a group that seeks the destruction of Israel, that openly celebrates violence and terrorism, and that traffics in anti-Semitism," Block said. "JVP can call itself whatever it wants, but it neither stands for anything remotely Jewish, nor should it ever be confused for a voice for peace." This entry was posted in Issues and tagged Anti-Semitism, Facebook. Bookmark the permalink.